Green, red and white Christmas pin badge. 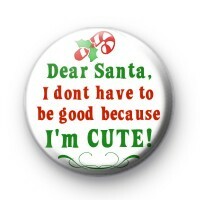 This funny 1-inch festive themed button badge has the text 'Dear Santa, I don't have to be good because I'm Cute. Such a fun, sassy Xmas badge. Great to add as a Stocking Filler or to hand out at your Christmas Dinner as a bit of fun & a great way to get the Party started. All our badges are handmade in Cornwall.